Temporary road works will restrict access to Eton Wick from the Keate’s Lane junction. Courtney Buses have agreed to use a smaller vehicle for the duration of the works, following the agreed diversion route along Meadow Lane and South Meadow Lane. 0905 from Slough will go to Eton, then divert via A4 to Taplow Sainsburys and continue to Maidenhead. Normal service will resume from 1540 from Slough. The diversion via A4 will take approx. 7 minutes extra so there may be some delays, but potential to “catch up” at the layover at Eton. 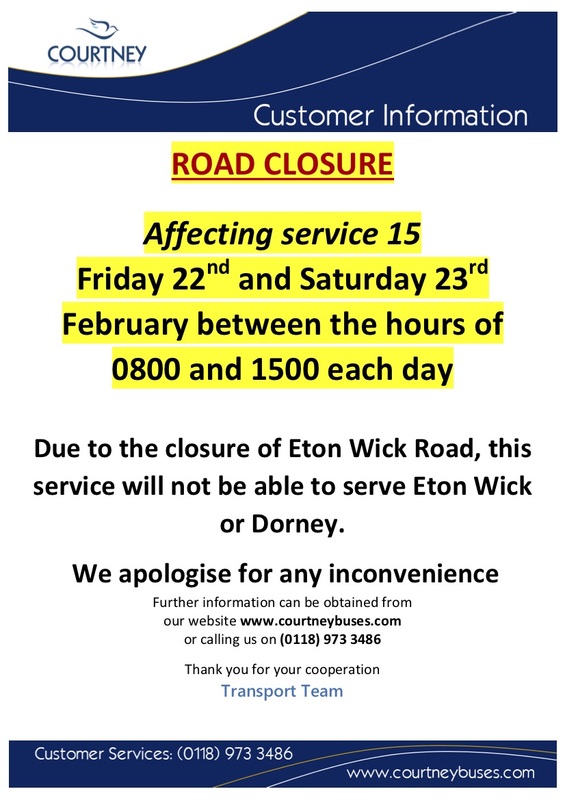 Eton Wick and Dorney will not be served between 8am and 16:00.